I’d always been curious about quinoa ever since I saw it in one of those British shows where these people try to come up with the next big thing in food. One woman prepared quinoa salad and although she didn’t win the contest, the word itself intrigued me. Was it pronounced “kweeNOwah” or “keeNOwah”? Apparently it’s “KEENwah”. A few months ago, I bought a Paleo diet book because the Coach wanted to try to go Paleo as much as possible. I flipped through it a few times and cooked meals using some of the recipes in it. So I bought a big bag of quinoa at S&R, thinking it was Paleo, but it turns out that quinoa is NOT Paleo at all because it’s a grain and therefore starch. It’s been a while since I cooked a meal at home. Most of the time, the Coach comes home from work late and I have dinner at my parents’ house otherwise I’ll end up passing out from hunger. But after a week or so of sitting at the dinner table with my husband while he eats, I thought it would be nice to cook and eat together. I wondered what to cook and remembered the bag of quinoa sitting untouched in my pantry. So I decided to cook salmon and quinoa. 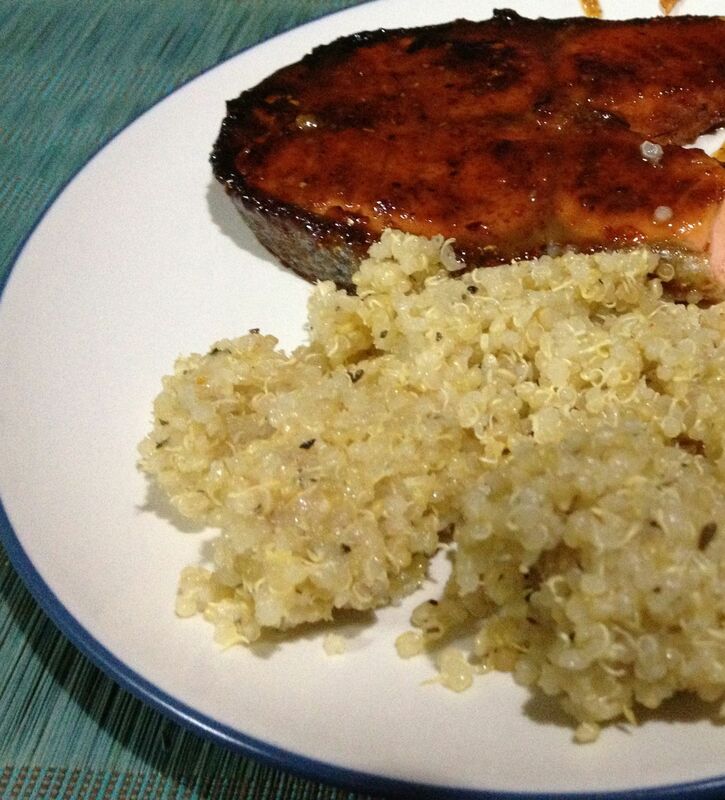 Looking online, I found a lot of recipes for salmon, but not many for quinoa. I didn’t need to look too hard though because I found both in the Food Network website. I got Bobby Flay’s recipe for Pan Roasted Salmon Steaks with Sherry Vinegar-Honey Glaze and Spicy Tomato Relish and Parsleyed Potatoes and Giada de Laurentiis recipe for Herbed Quinoa. In a small saucepan over high heat, reduce the vinegar to 1/8 cup. In a mixing bowl, combine the vinegar reduction with the mustard, honey and chile powder and season to taste with salt and pepper. Let rest at room temperature for 30 minutes. Heat the tablespoon of oil in a medium saute pan until almost smoking. Brush the salmon on both sides with the glaze. Place in the pan and cook until lightly golden brown. Place in the oven and continue cooking for 5 to 6 minutes for medium doneness. Remove from the oven brush again with the glaze. Pour the quinoa into a sieve and run under cold water until the water runs clear. It’s a good thing I researched on quinoa before cooking because if you skip this step, you end up with a really bitter dish. In a medium saucepan, add the chicken stock, quinoa and basil. Bring to a boil over medium-high heat. Reduce the heat to a simmer, cover the pan and cook until all the liquid is absorbed, about 12 to 15 minutes. In a small bowl, mix together the olive oil, lemon juice, parsley, thyme, and lemon zest. Season with salt and pepper, to taste. The verdict? I loooove quinoa. It’s nutty, slightly bitter and had a bit of a bite to it. There’s still a lot of raw quinoa left and there are many dishes I’d like to make using it. The salmon was really good too. It was hot (but bearable) and sweet. These are two dishes that I’ll definitely make again!